The Southern Ocean may be defined as the body of water lying south of the Antarctic convergence (roughly 55 degrees South and varying with the seasons), where the swirling frigid waters of the southern polar region meet the warmer waters of the southern Atlantic, Indian and Pacific Oceans. Like Antarctica, it contains vast, unexploited resources that could provide an important source of international revenue. The region is also a delicate ecosystem, and its development should be viewed circumspectly. Antarctica's political status hangs in a delicate balance, with seven nations claiming sovereignty over parts of the continent, and various - mainly developed - countries having formed an Antarctic club. How these questions are resolved will be a key to developing, protecting, and managing the unique southern polar region. The question of Antarctica has since been debated annually by the United Nations General Assembly. As expected, the countries with territorial claims on, or interests in, the continent have called for a continuation of the Antarctic Treaty. The developed countries have proposed modalities for the possible development of its mineral resources (e.g., the United States and New Zealand) and environmental protection through the declaration of Antarctica as a "World Park" (e.g., France and Australia). And most less-developed countries have pressed for declaring Antarctica part of the common heritage of mankind. This is the official position, for instance, of the Organisation of African Unity. The Group of 77 is not united on this issue, since several of them have staked claims on the continent or are parties to the Antarctic Treaty. The upshot of these discussions is important, in view of the region's vast resources, including fisheries and offshore oil and minerals. A major resource of the Southern Ocean is krill, a shrimp-like crustacean rich in protein, and suitable for both human consumption and animal feed. About 5 centimetres (2 inches) long when mature, with antennae adding another 2.5 centimetres (1 inch), krill contains about 15 per cent protein by net weight - roughly equivalent to beef, shrimp and lobster. Krill are found in great numbers south of the Antarctic convergence (Map 1) where phytoplankton flourish in the circular flow of ocean currents and the upwelling of nutrients during the Antarctic summer. Estimates of the annual sustainable yield of krill have ranged as high as 1,000 million tons. More recent estimates are 110 to 150 million tons, which is double the total 1977 fish catch of 70 million tons. Conservative estimates by US scientists are 1 to 2.5 million tons, and by Soviet scientists 15 million tons. These are based on an ecosystems approach, taking into account the possible effects of catch levels at all points in the food chain, krill being a major food source for other fish, whales, birds, and seals.10 Even these lower estimates portent the Southern Ocean as one of the world's largest fisheries. Partly as a result of the decrease in the whale population, the krill population has grown considerably, and the consensus is that there is no present danger of overexploitation. Much of the whale population feeds in the Southern Ocean, and charging for whaling and krill fishing in this area could serve the purposes of producing substantial revenues and keeping development at sustainable levels. With conflicting claims on Antarctica, there are especially strong grounds for declaring the Southern Ocean res communis - part of the common heritage of mankind. It is questionable whether claimants can declare EEZs in the Southern Ocean since some of their territorial claims overlap and the major powers, including the United States and the Russian Federation, do not recognize these claims.11 Fishing in the Southern Ocean could then be the subject of international taxation, user charges, leases, or the sale of permits to fish. There is geological evidence of mineral resources, including gas and oil, offshore the coast of Antarctica. The probable locations are the Ross Sea, the Weddell Sea Basin, the Amundsen Sea continental margin, and the Bellinghausen Sea continental margin. (See Map 2) There are environmental considerations to be borne in mind, and formidable physical obstacles, especially the distance and harsh climate of the region. A parallel may be drawn with the northern polar region, where technology has been developed for the North Sea, the Beaufort Sea and coastal Labrador's "Iceberg Alley." If the industrialized countries engage in offshore oil development off the Antarctic coast, a system of taxes, user charges, fines, permits, and leases could be used to help ensure environmentally sound development and a source of revenues for mankind. From Grotius' time until the early twentieth century, virtually the entire ocean area was considered a global common in the sense that the high seas were open to navigation and fishing by citizens of all nations. The use of the oceans for transport threatened no one since, except in rare situations of congestion of a few shipping lanes and fisheries, nothing of value was scarce. Only the territorial seas which were limited to 3 nautical miles from coastal baselines - and internal and archipelagic waters were excluded. With the advance of technology and sophisticated warfare, territorial seas were extended to 12 nautical miles. This was the situation before UNCLOS III. With the blessings of the Law of the Sea Convention, coastal States have appropriated "exclusive economic zones" (EEZs) extending 200 nautical miles (230 statute miles) from coastal baselines from which the breadth of the territorial sea is measured. In the EEZs, the coastal States have exclusive rights a) for the purpose of exploring and exploiting, conserving, and managing the natural resources, whether living or nonliving, of the waters superadjacent to the seabed and of the seabed and its subsoil; and b) for managing other activities for the economic exploitation and exploration of the zone, such as the production of energy from the water, currents, and winds.12 This was a reversal of the long-accepted doctrine of Mare Liberum. Under the principles of equity and traditional pre-UNCLOS III international law, the resources of the oceans, up to and excluding the territorial seas, should be shared by all mankind. The reason is clear: they are part of the res communis or, according to modern concepts of intergenerational equity, part of the common heritage of mankind. The Convention of the Law of the Sea tries to take account of these principles by giving land-locked States certain rights to explore and exploit the resources of the EEZs, after negotiation with the coastal States. In practice, however, this does not seem a promising procedure for the land-locked States. To date, no cases of revenue sharing have been reached. For this reason, the Convention of the Law of the Sea was a step backwards in the development of the principles of international equity. The EEZs, which contain the shallower waters and the bulk of the continental shelves of coastal States, contain most of the currently valuable natural resources, both living and non-living. 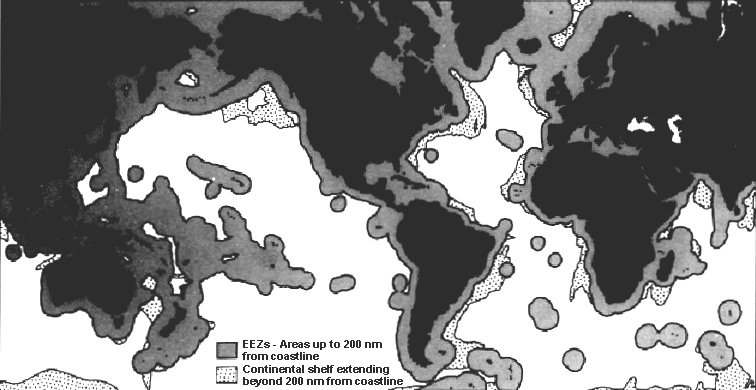 The non-living resources, which include hydrocarbons, are extensive because the continental shelves are much older geologically than the deep ocean bed. The EEZs also contain the world's most productive fisheries. This is partly due to the upwelling of deeper waters along continental shelves, bringing nutrients toward the surface waters, and, from the viewpoint of the economics of transport, to their proximity to the coast. The appropriation by coastal States of the EEZs has substantially reduced the available global commons, in a manner similar to the reduction of the commons by the enclosure movement in Europe. About one-third of the world's oceans are now encompassed by these zones. These, as well as the continental shelves, are shown in Map 3. The declaration of EEZs is in contravention of the principle of res communis, which forbids nation-states as well as individuals from appropriating any part of common property as private property. There is a distinction, furthermore, between the EEZs and the territorial waters. The coastal States exercise sovereignty over the latter but not over the EEZs, which Cooper and UNEP, among others, have called a "privilege conferred by the international community. "15 It is reasonable, therefore, for the world community to ask the coastal States to provide a portion of the income they derive from the EEZs to a global authority for international uses, including assistance to land-locked developing countries. Such an arrangement, it may be recalled, was proposed by Nepal in the form of the creation of a "Common Heritage" Fund. A "gentleman's agreement" for the sharing of revenues from the EEZs could still be forged and would not contravene any of the sovereign rights of the coastal States. The Law of the Sea Convention has established an institutional framework for the mobilization of resources from the exploitation of the deep ocean bed in the form of the International Seabed Authority, which will be responsible for licensing and collecting fees for the mining of the deep ocean bed by private firms, and the Enterprise, which may itself mine it under a parallel system of seabed mining. It is evident from this discussion, however, that the sources of revenues that can be derived from the oceans are much more varied and extensive: they can be from the deep ocean bed, from fishing on the high seas, from taxes on trade through freight and over-flight and on passenger traffic, from a system of taxes, user charges, fines and permits for commercial activities in the Southern Ocean and others. These resources can be placed in a general fund for general international use. A significant part, however, should be allocated specifically for ocean governance and development. Activities for these purposes are also myriad: there is a need for regulation, enforcement of the provisions of the Law of the Sea when it enters into force, for research on ocean resources and the way it influences climate and might in the twenty-first century even be used to forecast or modify climate and regional weather patterns. The establishment of an Oceans Assembly is described in chapter 19. It could be a forum for policy making and the initiation of new activities. To be effective, it should be tied to a new specialized agency or institutional mechanism linking the existing bodies concerned of the United Nations system (also proposed elsewhere in this book), which would deal with policy implementation and the conduct of day-to-day operations on ocean affairs. Such an agency or coordinating mechanism could be made responsible for the operations necessary for the mobilization of the ocean resources noted previously, with the exception of those general resources derived from trade taxes, which in view of their general nature would require a special body within the United Nations itself. The Oceans Assembly could provide general guidance to the oceans' organization and also be responsible for the allocation of those ocean revenues specifically earmarked for ocean governance and development. It could also make recommendations to the United Nations on the use of any surplus ocean revenues that can be allocated for general purposes. 1. Mendez, P. International Public Finance: A New Perspective on Global Relations. New York and Oxford: Oxford University Press, 1992. 2. OECD. Development Cooperation 1992 Report, Table 3.1. 3. Sivard, R.L. World Military and Social Expenditures, Table I. Leesburg, Va.: World Priorities, 1989. 4. Hardin, Garret. "The Tragedy of the Commons." Science, vol. 162, December, 1968, p. 1243. 5. Dolan, E.G. TANSTAAFL (There ain't no such thing as a free lunch): The Economic Strategy for Environmental Crisis. New York: Holt, Rinehart and Winston, 1971. 6. For instance, see Overall Socio-economic Perspective of the World Economy to the Year 2000. United Nations, New York, 1990, pp. 50-51. 7. This is an estimate by the United States Academy of Sciences, cited in Steinberg, E., and A. Yager, New Means of Financing International Needs. Washington, D.C.: Brookings Institution. 1978, pp. 106-107. The Academy's estimates were made before such recent oil spills as the Exxon Valdez and those in the Arthur Kill of the New York-New Jersey harbour, in Europe, in the Gulf and in other places. 8. UNEP. Additional Measures and Means of Financing for the Implementation of the Plan of Action to Combat Desertification: Study prepared by a group of experts in international financing in accordance with General Assembly Resolution 32/172. (Issued initially as UNEP document UNEP/GC.6/9/Add.1, 4 April 1978.) Submitted to the General Assembly at its thirty-third session with a Note of the Secretary-General (A/33/260 of 6 October 1978). 9. Segarra, Amada. "The Question of Antarctica." Disarmament, vol. VI, No. 2, Autumn/ Winter 1983, pp. 49-53. 10. Nicol, Stephen, "Who's counting on drill?," in Bioscience, December 1990; and Shapley, Deborah, The Seventh Continent: Antarctica in a Resource Age. Washington, D.C.: Resources for the Future, 1986. 11. As a result of a sharp reduction of finfish stocks in the early 1970s, the French authorities, who exercise sovereignty over Kerguelen Island, declared an EEZ and banned fishing for two seasons. This is the only EEZ that has been declared, and it is doubtful whether the claimants to the Antarctic territory can declare EEZs under the present international law. 12. United Nations Convention on the Law of the Sea, art. 56. 13. As a concession to considerations of equity, the Convention gives land-locked countries equal access to the EEZs of adjacent coastal states (articles 69 and 79). In that part of the continental shelf beyond the 200-mile limit, "the outer continental shelf," the coastal state must contribute to a system of revenue sharing -1 per cent of the value or volume of production starting with the sixth year following commencement of commercial operation, then increasing by 1 per cent annually up to a maximum of 7 per cent (article 82). Less developed countries can also lease rights to the exploitation of the EEZs, although this right does not extend to land-locked countries. See United Nations Office for Ocean Affairs and the Law of the Sea, Introduction to National Legislation on the Continental Shelf (UN sales No. E-89.V.5), pp. 5-6. Many do not consider these concessions sufficient to the gains from the establishment of the EEZs. 14. Both quotations are from Grotius' Mare Liberum. 15. UNEP, Additional Measures and Means of Financing for the Implementation of the Plan of Action to Combat Desertification. op. cit. and Cooper, Richard, "The Oceans as a Source of Revenue." In Bhagwati, J.N., ed. The New International Economic Order: The North-South Debate. Cambridge, Mass. : MIT Press, 1977, pp. 108 and 111. During the last two decades the expansion of the multiple uses of the oceans and the degradation of the marine environment have accentuated the need of enhancing international cooperation and coordination in the field of management, and protection of marine resources. A significant number of international legal instruments have been adopted to that effect, and existing intergovernmental organizations have been assigned with specific responsibilities in ocean affairs. New predominantly regional institutions, have been established, and at the same time institutional adjustments made at national level. Thus, an impressive legal and institutional network has been set into operation in the management and protection of the marine environment; this wide network could provide a viable basis for the global governance of the oceans. Efforts have been made to achieve better coordination between ongoing programmes, projects, and activities on ocean affairs undertaken by competent international organizations. In this context, it should be noted that an effective global management regime of the oceans would require a two-dimensional integration: horizontal and vertical. 1. Developmental and related issues, including the functioning of the worldwide system of navigation, management and conservation of highly migratory species, sustainable technology development, marine scientific research, and other economic issues of global significance. 2. Environmental problems of global dimensions, such as climate change, reduction of the ozone layer, sealevel rise, decreasing biological diversity, disposal of hazardous wastes, and other problems requiring global action. 3. Peaceful uses of the oceans and enhancing international security through special agreements on naval arms control and disarmament, confidence-building measures and reduction of naval operations. 4. Legal problems with special emphasis on universal adherence to the United Nations Convention on the Law of the Sea of 1982 (the 1982 Convention), further codification and progressive development of the Law of the Sea, elaboration of guidelines on integrated global ocean management, harmonization and unification of the rules of maritime law, and promotion of international environmental law, particularly in the field of the protection of the marine environment. The vertical integration of ocean management comprises an interface of national actions, regional and global cooperation. International organizations and inter-agency bodies provide multilateral institutional mechanisms for coordination, supervision, decision-making and implementation of policies, and generally agreed rules relating to ocean affairs. - The shared resources characteristic of many regional seas make forms of regional management mandatory. Therefore the effective governance of the oceans requires both horizontal and vertical integration with the relevant institutional implications deriving from the nature of the marine ecosystems and the sustainable development of their resources. This is the leading principle determining the concept of an "Ocean Assembly" as a world forum for the consideration of issues of common interest and coordination of national, regional, and global efforts on ocean affairs. The existing situation has been characterized in most instances with sectoral approach; fragmented national, regional, and international institutions, often guarding their special domain of responsibilities; prevailing zonal approach in dealing with sea management and protection of the marine environment; "effects oriented" and "clean-up pollution" control measures; and discrepancy between the environment and development components of ocean policy and planning. This assessment is even more valid to ocean governance, for in the field of ocean affairs the interaction between environment and development is much more evident. The perception that problems of ocean space are closely interrelated and need to be considered as a whole led, at an advanced stage of the negotiations in UNCLOS, to the recognition that institutional adjustments were required to meet the new challenges of ocean governance. The traditional sectoral structures of public administration could not adequately meet the new requirements of the expanding use of oceans and their resources. The same deficiency was noticeable, in most instances, in the activities of international organizations when dealing with ocean affairs. During the Seventh session of UNCLOS in 1978 three formal proposals referred to various institutional implications as a follow-up of the United Nations Convention on the Law of the Sea. The delegation of Peru proposed the establishment of an International Commission on the Law of the Sea (Doc. A/CONF.62/L. 22 of 10 April 1978). This Commission was contemplated "as an intergovernmental body responsible for the examination of problems which arise in connection with the application of the provisions of the present convention, as well as from situations not covered by it." Members of the Commission had to be ipso facto all States Parties to the convention. The functions and powers of the Commission were confined to the legal field which is evident by the name of the Commission. The Commission was envisaged "as a forum for the examination of proposals aimed at improving or supplementing the provisions of the present Convention and for the preparatory work of conferences convened with the view to amending or revising the Convention." It is obvious that the proposal of Peru preceded the adoption of the provisions on the amendment of the Convention, the present articles 312, 313 and 314 of the 1982 Convention which provide for a different procedure for amending the Convention. Nevertheless, leaving aside the outdated suggestions of a procedural nature, the ideas reflected in the proposal of Peru were an indication of the keen interest given to some legal and institutional problems relating to the implementation of the Law of the Sea Convention. When listing the powers and functions of the proposed International Commission on the Law of the Sea special reference was made to the "development, consolidation and coordination of the activities of international organizations related to marine affairs through recommendations of a legal nature on conceptual, technical or operational questions, including the preparation of standards, general guidelines and uniform methods of interpretation or application." It was also contemplated that the commission may "serve as a forum for the examination of proposals aimed at improving or supplementing the provisions of the present Convention." The most closely connected with the idea of a "World Ocean Forum" or an "Ocean Assembly" was the proposal of Portugal regarding periodic conferences on international ocean affairs (Doc. A/ CONF, 62/L.23 of 4 May 1978). In fact it was a most cogent initiative responding to the new requirements for better cooperation and coordination in order to overcome the sectoral approach in ocean management. The core of the Portuguese proposal was the provision authorizing the Secretary-General of the United Nations to convene a periodic conference open to all States Parties to the Convention and entailed undertaking "a comprehensive review of the manner in which the regime established by the convention is being applied, with the exception of part XI and its annexes;" (this exception follows from articles 154 and 155 of the 1982 Convention containing special rules for undertaking the review of the system of exploration and exploitation of the resources of the Area). It further provided that in the exercise of its powers the review conference "shall take into account major trends in ocean uses, new technologies, progress in scientific knowledge, management and protection issues of international significance, institutional and legal developments and other relevant aspects of international ocean affairs." Another important function of the proposed conference was, in a special session "to review the state of ratification of the Convention and, if necessary, to propose measures to encourage further participation." In contrast to the above-mentioned Peruvian proposal, the periodic conference under the Portuguese proposal was not empowered to amend the Convention. This provision is in accordance with the procedural rules on the amendment of the Convention, embodied in its final clauses. Further strengthening of these organizations and increased cooperation among them are required, so as to allow Member States to benefit fully from the expanded opportunities for economic and social progress offered by the new ocean regime and to meet their responsibilities in scientific research, protection of the marine environment, transfer of technology, conservation and management of resources, and other relevant activities. This comprehensive approach to ocean affairs was supported by two important suggestions of institutional character. First, "to consider ways and means of rationalizing further the work of the international organizations through the improvement and strengthening of coordinating mechanism," and "improve inter-agency coordinating mechanisms with particular regard to the need for harmonizing the discharge of the functions of the international organization." Secondly, to establish "on broad geographical basis, an ad hoc study group of not less than 14 or not more than 20 eminent persons intimately acquainted with international ocean affairs to review and identify gaps in the present institutional arrangements in the field of international ocean affairs, evaluate the institutional implications resulting from the implementation of the Convention, and formulate alternative proposals aimed at improving where appropriate, the effectiveness of the United Nations system in the sector of ocean affairs, and on its gradual adjustment to the functions referred to in the Convention." The above-mentioned three proposals on the institutional implications of the new ocean regime, taken together could have provided a sound basis for effective cooperation and coordination in the management of the oceans on global level. They would have contributed to using the 1982 Convention as an appropriate legal and institutional framework for global ocean governance. While receiving encouraging support from many delegations in UNCLOS these proposals were overshadowed by the negotiations on some critical issues relating to the deep seabed mining regime and other controversial issues. Thus, institutional arrangements in ocean management lost momentum and became a matter of research and academic debate. Several studies on the subject were undertaken, including some within the framework of the International Ocean Institute (IOI) and the Pacem In Maribus (PIM) conferences. Confronted with practical problems of discharging their respective responsibilities, in the context of a new ocean regime under the 1982 Convention, various UN agencies undertook moderate institutional adaptations. Cases in point are, for instance, IOC - in relation to marine scientific research, ocean services, regional cooperation, training, education, and mutual assistance; IMO - in respect of international shipping, safety of navigation, and pollution from vessels; UNEP - on regional seas management and protection of the marine environment through its Ocean and Coastal Areas/Programme Activity Centre (OCA/PAC) coordinating an extensive global network of regional seas-related programmes. In the United Nations the Office for Ocean Affairs and the Law of the Sea (UN/OALOS) was established with a wide range of responsibilities, incorporating functions previously assigned to other organs. Other international organizations such as FAO, maintained their traditional structure at global level but introduced adjustments in their regional subsidiary fishery bodies. These developments have proved that the magnitude, complexity, and urgency of environmental problems, and the long-term solutions to the critical issues of ocean management, require a comprehensive integrated approach and coordinated efforts of governmental agencies, intergovernmental institutions with the increasing involvement and participation of the non-governmental sector on the national, regional, and global levels. Institutional adjustments to deal with ocean affairs at the national level have made surprisingly limited progress during the last two decades, with a few exceptions. In fact, even in those countries which are signatories or have ratified the 1982 Convention, the traditional sectoral approach continues to dominate national administration. This is so despite increasing and intensive multiple use of the oceans and the growing difficulties faced in ocean management and environmental protection. Rather than attacking the problem at its roots, and undertaking an in-depth restructuring of their marine affairs institutions, governments have tried, on the one hand, to improve the efficiency of existing institutions and, on the other hand, to develop cooperation among them with a view to responding in a more efficient way to specific issues. Under crisis, ad hoc arrangements have been established, involving the various departments concerned. This was done in connection with large-scale marine pollution accidents having detrimental ecological and socio-economic impacts. Nevertheless, some governments, considering the advantages of more stable and efficient mechanisms to deal with national ocean affairs on an intersectoral basis, moved a step forward. One should refer to the creation of Ministeries of the Sea, some of them with short duration, as was the case of France, Norway, Chile, Peru, and Portugal. In the last case, a Ministry of the Sea has recently been reestablished. Other countries, like India, followed a more decentralized approach based on the principle of a central formulation of policies and priorities in ocean affairs. This was supported by funding and coordinating procedures, aimed at the mobilization of national capabilities in the relevant fields, through involvement in the process of decision and implementation of public administrations and institutions concerned. The Department on Ocean Development of India proved to be an effective mechanism with some striking successes, namely regarding India's role in deep sea research and exploitation, and research in Antarctica. In spite of the need for vertical interface at national, global, and regional levels, and their mutual impact and feedback, effective and stable progress in international ocean affairs has been hampered up to now by the institutional inertia at national level, as well as by the vested interests of existing organizations and agencies. Therefore the concept of an "Ocean Assembly" at national level involving all the parties concerned, is of particular practical significance. The UNCED, inspired by the principle of sustainable development, has imposed a critical review and evaluation of the state of ocean resources and the marine environment, as well as the need to urgently respond to some new forms of degradation and to consequences of human activity, such as that resulting from the greenhouse effect and related sealevel rise. UNCLOS and UNCED are, thus, closely interlinked components, and part of a process of new governance of international commons, including ocean governance. In our view, IOMAC reflects adequately the new philosophy and the need for an enhanced ocean governance based on international cooperation provided under the 1982 Convention. The establishment, for these purposes, of "national focal points" also reflects the need for simultaneous and parallel action at national level. It would be advisable for similar arrangements to be undertaken by the organizations of the United Nations system involved in ocean affairs and carrying out substantive activities in the respective region. Thus, IOMAC offers a possible institutional model for dealing with international ocean affairs at regional level. In fact, it performs similar functions to those of a regional Ocean Assembly. This brief overview of the evolving idea of global institutional arrangements on ocean issues may provide the background for determining the concept and institutional features of an "Ocean Assembly."